Manhattan Beach attracts many new residents due to the location, but there's far more to the area than just gorgeous beaches and amazing weather. The schools in the area are some of the best you'll find throughout the state. Many of the schools have received a 10 out of 10 rating by greatschools.org, which provides the most accurate ranking for schools in the country. Here are the top choices throughout Manhattan Beach. Aurelia Pennekamp serves nearly 600 students from Kindergarten to 6th grade. The school has received a number of five star ratings from parents in the area. They are rated as a five-star school with five stars in both parent involvement and principal leadership categories. They also received four stars for teacher quality and their test score averages are far above the state average. Grand View is another top rated school in the area with many five star reviews. However, they only received five starts in the parent involvement category with four stars in both the teacher quality and principal leadership categories. Their test scores are a little higher than Aurelia Pennkamp and they've risen over the past year, as well. Serving over 500 students, Meadows Avenue Elementary School provides education for kindergarten through 5th grade. The school received five star reviews for the teacher quality and parent involvement categories, along with four stars for principal leadership. Test scores are above the state average and about the same at Aurelia Pennkamp. 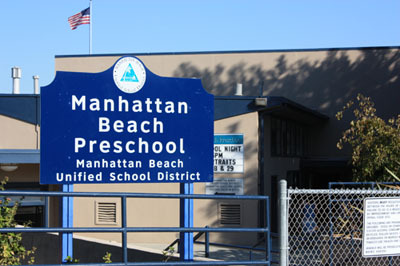 If you have children aged 2 through 5 years, Manhattan Beach Preschool is a great option. It’s part of the Manhattan Beach Unified School District and maintains a low teacher-child ratio. Being part of the cities school district assures parents that their kids will be well prepared to enter elementary school once they’re old enough. Serving grades 8 through 12, Mira Costa has over 2,400 students with an average class size of 30. It received four-star reviews in both teacher quality and parent involvement. The principal leadership was rated at three stars and the test scores are far above the state average. This is the top rated public high school in the area. It's so great to know that the local schools are so well regarded. When my first child is born soon, it looks like he will have access to a great education from pre-school through high school!